Hi friends! We’ve updated the look of the site. We’re still not done, and the bells and whistles aren’t quite there yet, but we’re working on it, and thanking you all for your patience as we usher in a new look for The Makati Dentist. Thanks!< By the way, that's my lovely wife, the Makati Mady Dentist, Mel, working with some newfangled gadget that my webmaster has no idea what it's called. Christmas is here and food is aplenty. Your makatidentist would like to leave some reminders for the holidays to help keep your teeth in good health. 1. Over the holidays, many of us crack our teeth, thinking our teeth are made of steel. Truth is, under that hard enamel shell is a very sensitive nerve running through a root surrounded by soft living tissue. 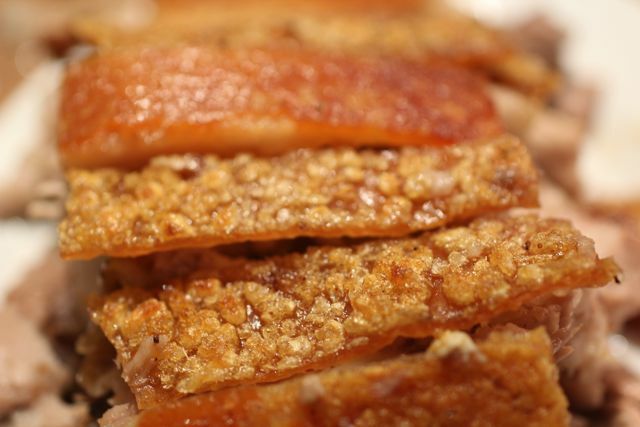 Crunch on a lechon skin and welcome pain. Yes, cracking a tooth is an intensely painful experience resulting in the urgent need for a root canal and crown. Hey, I won’t be around when that happens so choose what you eat. 2. Don’t give in to the temptation to bite down on that candy cane. Also, damaging acids form in the mouth every time you eat a sugary snack and continue to affect the teeth for at least 20 minutes afterwards. 3. Your teeth are not bottle openers. If you don’t want to have us make an implant + a crown or bridge in your mouth, for heaven’s sake, carry a bottle opener on your keychain. 4. Alcoholic and carbonated drinks erode (melt) the enamel of your teeth. So follow this up with lots of water. 6. If you don’t have a tooth brush, rinse your mouth thoroughly with water to wash away food particles, produce more saliva and neutralize acids in your mouth. You must have heard of Xylitol, right? Did you know that Xylitol is a natural sweetener, good even for diabetics? And that this sweetener, fights the bacteria that churns out plaque / tartar and produces ACID, therefore causing cavities on your teeth? And did you know that within 1 HOUR after eating, these bacteria starts partying and release their powerful acids to melt the tooth enamel? 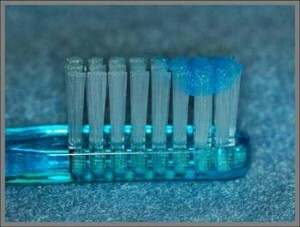 So, when you forget your toothbrush at home, what can you do? Chew on a xylitol candy immediately after eating. A xylitol gum is a no-no according to your dentist in Makati. He practices Temporo-Mandibular joint disorder therapy and treatment; repeated chewing is not good for your TMJ health (more on this in another post). You can opt to carry xylitol mints and candies in your bag wherever you go. tooth shaped candies in a tooth shaped container. Cute, right? Or you can choose to use a xylitol swab that is also used for babies. Yes, you heard that right. Best for babies, best for you. Your dentist in Makati discovered in the recent dentists’ convention another cute and affordable supplement to protect your teeth! 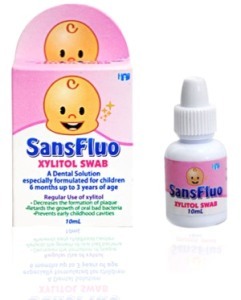 A dental solution especially formulated for children 6 months up to 3 years of age. Xylitol Swab has a high concentration of xylitol that is applied or coated on the tooth surface and gumline of children to inhibit the formation of plaque that causes tooth decay. You use according to what its name implies. With clean hands of course. 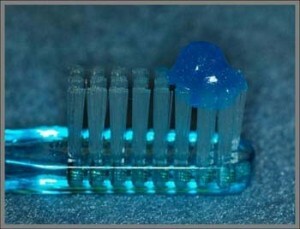 Immediately after eating, swab a drop or two of this sweet stuff all over the surfaces of your teeth. Swab it the same way for your kids or baby. The xylitol will markedly reduce the acid pH (you know this in high school chemistry) in your mouth, ‘starving’ the bacteria and prevent it from making further damage on the enamels of the teeth. Your baby would greatly benefit from this since they are always drinking milk or snacking every hour or so. Lowering the chances of the bacteria from producing acid means more time for the teeth to replace its lost mineral components. Xylitol, with regular brushing with fluoride toothpaste, doubles the protection/strengthening of your and your baby’s teeth. 1. The World Health Organization has rated it as a safe food additive. 2. It is naturally found in the fibers of most fruits and vegetables. 3. It lowers the chance of plaque and tartar build up with regular use. 4. It stops cavities from forming. 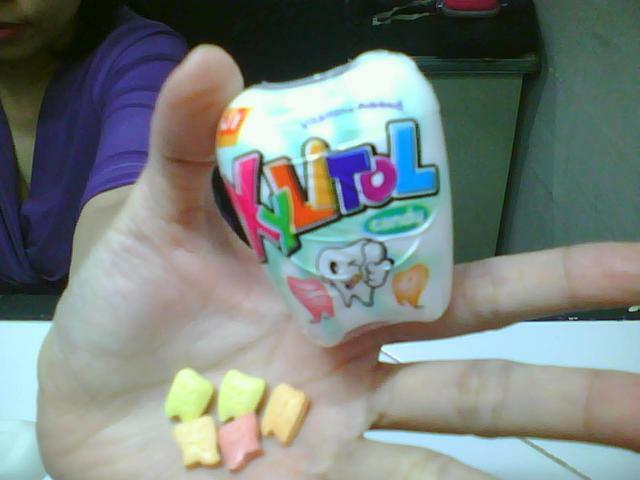 The xylitol candies however, are out of stock. Candy monsters have consumed all our stash. The answer is yes, according to the Pediatric Dentistry Center Philippines. And the makati dentist agrees so. Here are some of our recommendations. 1. Use a toothpaste that is formulated for kids. The fluoride content is lesser than the regular toothpaste adults use. Remember, when bacterias attack the tooth, the minerals that make up the tooth weakens. Fluoride re-mineralizes the weakened part of the tooth. Fluoride also discourages the bacteria that produces the cavity-causing acids from attacking the tooth. 2. Combined with good oral hygiene and consumption of healthy food, the risk for decay in your child’s teeth is low. However, if you plan to constantly give sweet and sticky foods to your kids, fluoride will be of little or no help at all. 3. For children under 2 years old, use a SMEAR amount of fluoridated toothpaste. Babies still don’t know how to spit out toothpaste; ingesting minute amounts will not cause harm to his body or teeth. Brush their teeth after every meal, but use the toothpaste only twice a day preferably morning and night before going to sleep. If you live in places known to have very high levels of fluoride in the drinking water, or your family consumes fluoride-rich food everyday, use non-fluoridated toothpaste. 4. For those aged 2 to 5 years, a pea-sized amount is recommended. Remember that the parents should be the one to dispense an appropriate volume of toothpaste on a soft, age appropriate toothbrush. At this age, kids should be taught how to spit out the excess toothpaste. No need to wash it away with water, since the remaining fluoride can ‘bathe’ the teeth and offer higher level of protection from acid attack. Your dentist in makati also recommends that your child have fluoride treatment done every 6 months. This is highly recommended for kids 6 years and above. For kids younger than 6, check up and early exposure to a clinical environment will be beneficial to build a comfortable relationship between the makati dentist and your child. Did you know that sealants are plastic barriers to protect the chewing surfaces of your kids’ permanent molars from decay? The placement of dental sealants involves your dentist bonding a plastic coating into the grooves of your tooth (the tooth’s pits and fissures). The net result is a smoother tooth surface, one which is less likely to trap food and plaque and one which is easier to clean with your toothbrush. Between 5 and 7 years of age, the first permanent molars erupt. More than 90% of decay occurs in the deep grooves of the chewing surfaces of these molars. When teeth first erupt, the enamel is not completely hardened of calcified, and the teeth are very susceptible to decay. Fluoride treatment and placement of sealants should be done as soon as the molars have erupted and you can see the chewing surface clearly. If a primary (baby) molar has early decay on a chewing surface of their molars, and the child is cooperative, your kids dentist may recommend a sealant. But if this treatment is delayed, and once decay has penetrated the second layer of tooth structure, a filling must be placed. Here in our dental clinic in Makati City, Philippines, the importance of preventive treatment is far more beneficial than doing interceptive treatment since loss of tooth structure is minimized and the dental experience for a child more pleasant. For one, preventive treatment are usually painless, such in the case of placing sealants. It does require cooperation on the part of the child and parent. Children have a very high flow of saliva, a strong gag reflex, or an inability to open the mouth wide and long enough for access to the molars, thus making the procedure a little bit difficult. Your dentist in Makati will use different methods to manage these situations. But you and your child’s cooperation will help in placing the sealants a success. There are four six-year molars and four twelve-year molars. Because the teeth do not always come in at the same time, please note that all four permanent molars may not be sealed during one visit. Your dentist in Makati will have to make sure that the tooth is dry for the sealant to bond tightly to the tooth surface. A tooth preparation gel will be applied for 15 seconds. Afterwards, this is rinsed away with water and air dried. A bonding glue is light cured in the area and then the sealant is applied, usually with a tiny applicator. This is light-cured again to harden the sealant. The light curing machine doesn’t produce heat or any form of sensation on the tooth. The procedure takes only minutes for each tooth. Your child may eat right away. Sealants don’t last permanently and they do wear out. Retention rates are about 85% over three years. Grinding teeth and chewing ice, popcorn kernels, or hard candy can crack sealants. If a sealant is lost, the tooth is still more protected from decay than if the tooth had never been sealed. Don’t worry, cavities will probably not occur if the lost sealant is replaced during the next 6 month dental check-up, unless your child’s diet is filled with carbohydrates and sweets and oral hygiene is poor, sealants should be replaced as soon as possible since it is almost impossible to predict when or how fast tooth decay progresses. Sealants are one of the very best things our Philippine dentist in Makati has to offer, not just for kids, but adults as well. Sealing off the chewing surfaces of an adult’s molars will protect it from the continuous acid attack by normal bacteria present in the mouth, since the diet and lifestyle of adults is more extreme than that of children, the acid level in their mouth vary from day to day. Placement of sealants should be a part of everybody’s preventive regimen along with regular dental check ups and oral prophylaxis.